When the months turn cold and winter sets in, mice start to look for warm places to spend the winter. Those warm places typically end up being your house. The bigger problem, when they find a nice safe place to live, they tend to stick around when the weather turns warm, leading you to have to deal with a new mice infestation; leaving you with the finding ways to get rid of the mice. While traps and poisons work well for getting rid of rodents, it can be dangerous if you have small children and pets. 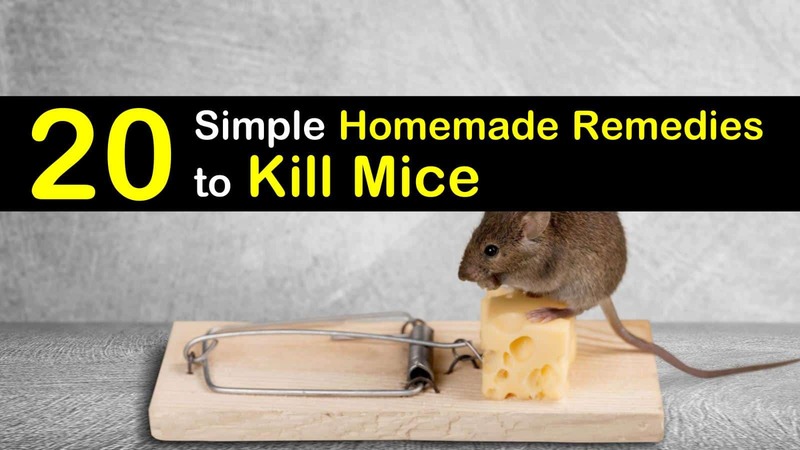 Here are some natural, homemade remedies to kill mice. What Attracts Mice & Rats to the House? If you are dealing with a mice infestation, there are better alternatives for getting rid of the mice and rats than poisoning them with harsh chemicals or trapping them. Here are numerous ways you can get rid of mice without putting your family and pets in the path of toxic chemicals. Soda is a common ingredient that you probably already have in your refrigerator, and if you don’t already have soda in your home, you can easily purchase it at your local supermarket or corner store. Pour the entire can of soda in a small bowl and put it in the area where you are noticing mice activity. When the mice drink the soda, the carbonation kills the mice shortly after they’ve ingested it. You can place several bowls around your house where you think mice are gathering, like under the kitchen sink or in your kitchen cabinets. One thing you want to keep in mind is that if the soda is left too long, you will attract ants, which turns into another mess on its own. The powder that is used to create cement is known as dry cement and is an excellent way to kill mice without using harmful poisons. When mixed with flour, the dry cement mixture becomes irresistible to the mice, who quickly eat it up. The combination makes them thirsty, prompting them to drink a lot of water. The mixture then dries up inside of them, swiftly killing them. To use this method, follow the steps below. Mix the ingredients in a bowl. Place the dry cement and flour mixture onto a paper plate and place it in an area where you notice mice activity or a place where you’ve found a significant amount of mouse droppings. Place a bowl of water near the mixture. If you discover that the rats aren’t eating the mix, you can always add a teaspoon of cocoa powder to the mix. Mashed potatoes work in the same way that the dry cement works. The sodium in the potatoes makes them thirsty. When they drink water after ingesting the mashed potatoes, the water causes the potatoes to expand in their stomachs, efficiently killing them. To make things easy, use instant mashed potatoes that you can purchase from any grocery store. After making the mashed potatoes spread a thin layer of mashed potatoes on a paper plate and place it in any mice-infested areas that you find. Place a bowl of water near the plate. After the mice have fed on the mashed potatoes, you will want to clean the area up to avoid attracting ants. You may be wondering, does peppermint oil repel mice? Peppermint oil is one of the essential oils that repel mice. Peppermint is a scent that most people like, but the fresh scent will keep mice away. Placing a little peppermint oil on several cotton balls and placing them around your house is a great way for how to repel mice. You can put the cotton balls in places where mice are gaining entry into your home and in your kitchen cabinets to keep them away. You can also plant mint around the exterior of your house to keep them away from your home. As a bonus, peppermint oil will also kill pesky insects like spiders and mites. While this may not be the most hygienic way for how to get rid of mice without poison, it is extremely efficient. Cats naturally prey on mice, so if mice suspect that you have a cat in your home, they will steer clear of your home. Placing used kitty litter in tubs near possible entry points into your home will keep mice well away from your home. They will smell the cat’s urine and flee the scene. One of the most efficient ways for how to naturally keep mice away is by introducing natural predators into your backyard and home. The simplest solution to a mouse problem is to bring a cat into your home. Bringing a cat into your house can eliminate a mice infestation in a matter of days. However, bringing a cat home is a serious commitment and take a lot of work. If you aren’t keen on getting a cat, you can try to attract barn owls to your property. Just like the cat, barn owls prey on mice and can quickly mitigate any problem you may have. To draw barn owls to your yard, you will need to build or buy a nesting box and place it in your yard, approximately 15 feet from the ground. Dryer sheets are an item that you probably already have in your home, but if you don’t, you can easily purchase them to help you repel mice naturally. The dryer sheets emit a scent that will have the mice fleeing your home. Just remember that the dryer sheets will begin to lose their scent and you will need to replace them often. The beauty about ammonia is that it mimics the smell of urine of the animals that like to prey on mice, without having to place urine around your house. To use ammonia to naturally repel mice, put a small amount in small plastic cups and put them around your house. You can create homemade traps with bacon fat or lard. This method is a bit messier than any of the other methods mentioned in this article, but it is extremely effective in getting rid of mice without poison. Run the metal wire through the can and tie the ends of the wire to the tub. Fill the container with water. Rub the lard or bacon grease into the outside of the can. Place the trap in your kitchen, or other areas where mice are a problem. The mice will try to get to the bacon fat and fall into the bucket, drowning in the water. Mothballs are a great homemade remedy to kill mice. They are extremely toxic and are an inexpensive way to get rid of vermin infestations. Using rubber gloves, place the mothballs strategically around your house, specifically in the garage, attic, basement, and pipes. It is essential that you use caution as mothballs can be extremely toxic to your pets and children as well. To get rid of mice and rats in your home, use a bay leaf to kill them humanely. Rats and mice are attracted to the scent the bay leaf gives off. However, the leaves contain secondary metabolites that are lethal to rodents when ingested. Placing bay leaves around your home where you have problems with mice will help you get rid of mice permanently. Bay leaves are also great for getting rid of roaches around your house. If you aren’t able to attract owls to your property, you can always use fake owls to help you get rid of mice in your home and yard. Both owls and snakes are natural predators of mice and will deter mice from entering your yard and home. You can place fake plastic snakes and model owls strategically around your yard to drive mice away. If you find that you have a rat or mice problem, you can use pepper to repel them from your home. Mice and rats will leave your home if you expose them to a scent that drives them away. If you sprinkle cayenne pepper around the perimeter of your home, you will quickly get rid of any mice that have taken up residence. For an even more effective deterrent, use the following homemade spray. Put the goggles and gloves on before you start. Bring the water to a boil. Blend the habaneros and pepper flakes in a food processor and place the pepper mixture into one of the two-gallon buckets. Pour the water over the pepper mix. Cover the bucket with a towel and let sit for 24-hours. Place the cheesecloth over the second 2-gallon bucket and strain the peppers out and fill the spray bottle with water. Sprinkle the mixture along with the exterior wall of your home, concentrating your efforts on affected areas and entrances. The mixture will keep for a couple of months if it is adequately covered and kept out of direct sunlight. Boric acid contains sodium borate salts that have been proven to be a natural mice repellent. When mixed with peanut butter it can become an excellent natural mice repellent that is extremely inexpensive. You can use ¼ cup Boric Acid and ½ cup of peanut butter to create marble-sized balls. Leave them in mice infested areas around your home and property so the mice can find them. When they eat the balls with the boric acid, their nervous system and stomach are affected, killing them almost instantly. Another homemade remedy to kill mice is raw sweet potatoes. They are a natural deterrent, and if they consume the raw sweet potatoes, it will kill them. Rats love sweet potatoes, but when they eat the vegetable, they experience a cyanide reaction in their stomachs that cause them to die. You can place small plates of raw sweet potatoes around your house to get rid of mice. Rats cannot stand the taste and smell of onions. If you place a sliced onion near their burrows, they will quickly leave the area. However, onions will quickly begin to rot if left out for an extended period, so unless you don’t mind the stench of rotting food, you’ll want to make sure to throw away and replace the onion every couple of days. While this isn’t the cleanest of methods to kill mice, it is quite efficient at killing mice. When mice and other rodents ingest the cow dung, it causes their stomachs to bloat. Since mice aren’t able to belch or vomit, they can’t get rid of the offending problem, eventually killing them. Spread the cow dung cakes throughout your garden and yard to not only kill rats but to fertilize your garden and lawn. One of the best homemade remedies to kill mice is Plaster of Paris. It is important that you keep this out of the reach of children and pets as it is a poison. There are several ways you can use plaster of Paris to kill mice in your home. In a bowl, mix the Plaster of Paris with the cornmeal and add the milk. Knead the mixture thoroughly until well combined. Tear off into small pieces and form into balls. Place the balls around your house. When the balls harden, replace with fresh ones. Using toilet cakes around your house is yet another way to repel mice from your home. The toilet cakes emit a strong smell that acts as a natural repellent and is perfect for refreshing the stagnant air. You can place several throughout your house in areas that tend to attract mice like the basement, attic, porch, and toilets. In a large bowl, mix equal parts sugar, flour, and baking soda. Fill smaller bowls with the mixture and place in areas where you have a mouse problem. When the rodents ingest the mixture, the baking soda will start to react with the gastric juices found in the mice’s stomachs. This causes them to become bloated, causing internal system rupture, effectively killing the mice. If you want to rid your house of mice without having to kill them with traps or poison, there are several essential oils that repel mice that you can use throughout your home and keep them from coming back to your home. Along with the natural ingredients that you can find in your home, there are several commercial products that you can use that are safe for use around children and pets. Mice and rats will enter your house during the winter months to find a warm, safe place to stay. Unfortunately, they tend to stick around when the weather begins to warm. A cluttered home and yard will attract mice and rats because it provides them with shelter and steady food supply. Dealing with mice in your home can be frustrating. Not only are they a pain, but they also carry deadly diseases like salmonella and hantavirus. While you can simply use poison to take care of mice infestations, this can be extremely dangerous, especially if you have small children and pets. 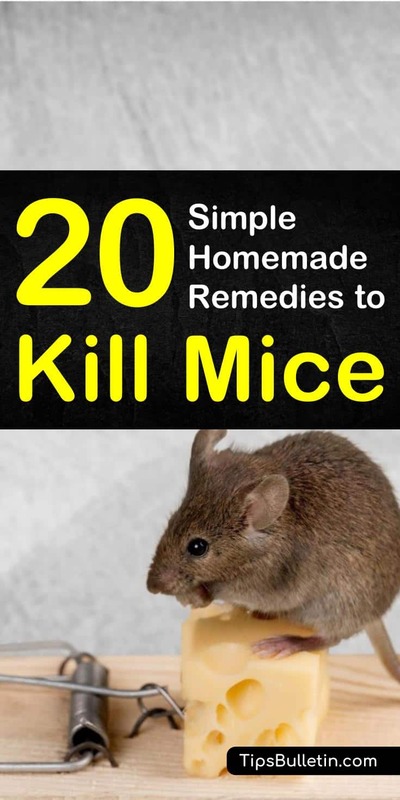 This article has provided you with twenty homemade remedies to kill and repel mice from your home. We hope you found the information in this article helpful. If you like what you read and know someone who can benefit from the remedies found here, please pass this article along.